RAC fold flat metal dog crates with plastic tray are ideal for dog owners looking for something more sturdy than a standard plastic pet carrier. You can put the dog crate together quickly without the need for any tools, and the plastic tray makes a suitable surface to place a blanket, cushion or towel for your dog’s comfort during travel. Each dog crate is made from durable steel with a non-toxic black powder coating for rust resistance. The plastic tray is removable to allow for easy cleaning and keeping a clean environment for your pet. The cage is designed to be placed in your car’s boot space and helps to restrain your dog and reduce driver distractions while the vehicle is in motion. 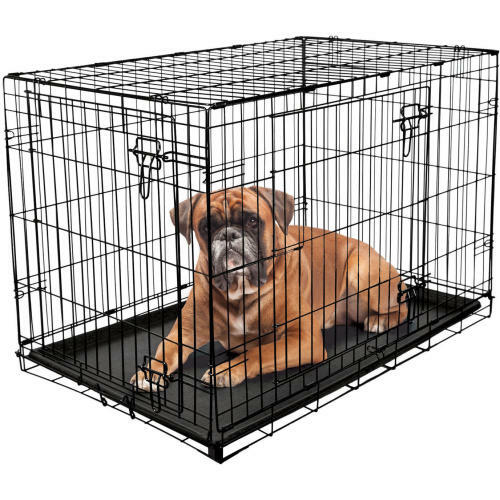 When measuring your dog for their crate, ensure they have enough room to stand up on all four legs, turn around, and lie down comfortably.